This testing started as a thread on the diyAudio forums. This story began several years ago with rumors that the 6AV5 was a possible substitute for the 6B4. Since the 6B4 is an octal version of the 6A3, which is a 6 volt version of the 2A3. some people were calling the 6AV5 a modern version of the 2A3. There was even an " urban legend" that in order to fulfill a government contract a major tube manufacturer made a large run of 6AV5's with the bases rewired as triodes and labeled them 6B4GA's. Several reports of 6B4's with straight sided glass envelopes and multiple grids were circulating on the internet, but no one had any pictures or other hard evidence. Apparently this question had been asked and experiments proposed on one of the other audio forums, but no one actually tested any tubes. Someone asked on diyAudio if this story was even possible since the 6AV5 has a maximum screen voltage of 175 volts. 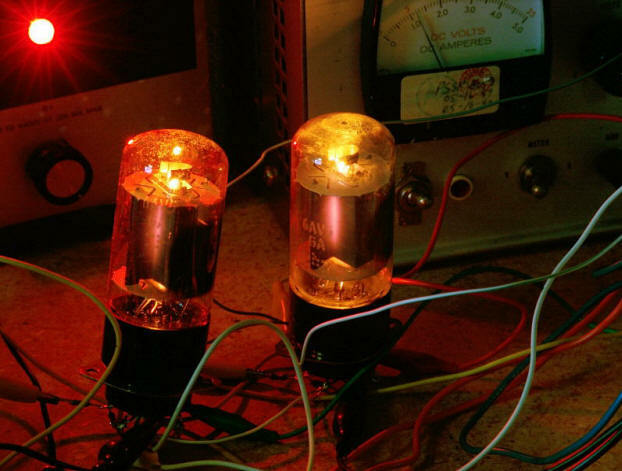 How could you triode wire it and apply 275 (or more) volts? Well I took this as a challenge and decided to compare the 6AV5 to the 6B4. How? First, I took a freshly built Tubelab SE board, and set it up on the bench. 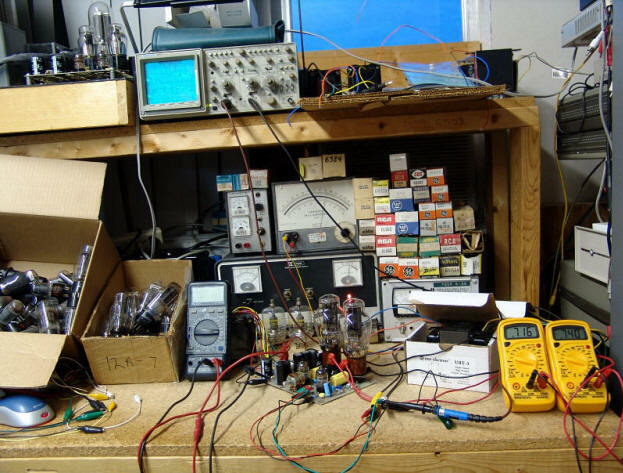 The rectifier tube was removed and the variable power supply seen behind the board was connected. This allowed variable B+ voltage. I connected up a pair of One Electron UBT-3 output transformers. 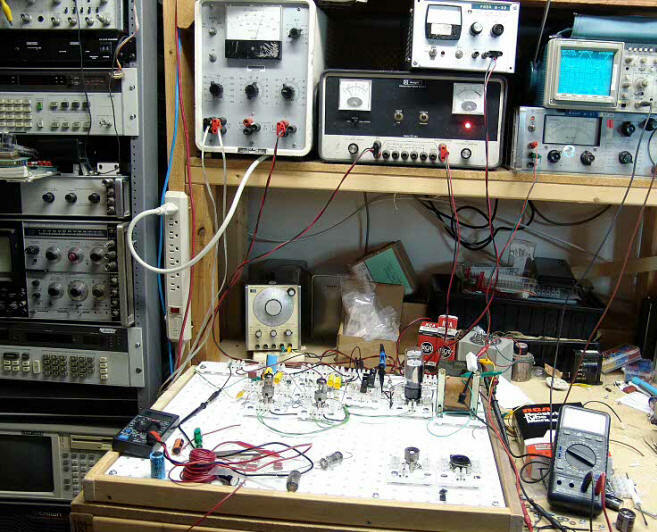 The amp is seen here operating with 300B's to verify proper operation, and to take reference measurements. I tested the setup with 300B's, which provided the expected 9 watts at 5% distortion (my common comparison point) with the power supply set at 400 volts. Listening tests proved that this setup sounded the same as an unmodified amp. Then I gathered up a few tubes that I wanted to experiment with. The box to the left of the voltmeter is full of 6B4's. Next test was a pair of NOS Sylvania 6B4's. I wired the 6B4's into the amp using clip leads. A separate power supply was added to power the filaments. Max voltage spec for the 6B4 is 325 Volts, so that is where I set the power supply. Power (at 5%) was just over 3 watts. They sounded like 2A3's, no surprise here. The bass was not as strong as the 300B's and some of the clarity seemed to be missing. I have used 2A3's in these amplifiers, and these sounded similar. I tried other used 6B4's and the sound was similar. I think that the Sylvanias were the best that I tried. Now for the 6AV5's. (NOS but unboxed and dirty GE's) I wired them up in triode connection, flipped the B+ switch, the current meter slammed to the right, and interference showed up on a nearby TV set. These puppies really like to oscillate. I re did all of the wiring, added stoppers right at the socket for G1, and G2. The oscillation was gone. I started at 250 volts. The tube worked, and biased up similar to the 6B4. It didn't sound half bad, in fact I think that it sounded better than the 6B4, but not as good as the 300B. I have never been one to follow specs (or rules) so I decided to turn up the voltage. 300 volts (plate and screen), no problem, no death glow, I had the bias set at 60 mA, which is 18 watts dissipation. Now these were starting to sound pretty good. Bass was far better than the 6B4's and at least on par with the 300B's, it sounded louder than the 300B's, but I made no power measurements yet. Time for more voltage, 325. These things ROCK. I am now running 325 volts at 75mA which is over 24 watts dissipation. I ran it this way for an hour. There is no death glow even with the room lights off, the screen wires are not glowing. This is over twice the recommended daily allowance of power flowing through this little guy, and it is still smiling. I made a power measurement and I am getting 12 watts at 5%. Distortion at 5 watts is under 1%. The sound is pretty good. Loud, dynamic, but not as detailed as a real triode. I tried putting the 8 ohm load on the 16 ohm tap to present a 1.5 K ohm load to the tube. Power rose to 15 watts, distortion went up at 5 watts to over 2%, and it didn't sound as good. OK, I still haven't killed it yet, so I turned the power supply up to 380 volts. Current is now 105 mA. (bias was never readjusted from the initial settings). This is almost 40 watts dissipation (some voltage is dropped in the OPT) the red glow is beginning to appear on the plate, however the screen grid wires are NOT glowing. This should alleviate any fears about violating the 175 volt screen rating. Power output is 17 Watts RMS at 5%. This amp now sounds loud, and dynamic, but at this level there is some oscillation seen on the TV on loud bass, which shows up in the sound. With everything connected up using clip leads, this is not unexpected. This was as far as I took the experiments on that particular thread, I went on to try other sweep tubes in triode wired mode. Some worked well and some did not like having their screen voltage rating violated. After that I started testing other tubes in my collection. Note: Since I did these experiments, and posted the results on the forums, I have actually SEEN and TOUCHED the "urban legend". The tubes DO exist. The one I saw was a Sylvania. It was clearly marked 6B4GA, and it looked IDENTICAL in construction to the Sylvania 6AV5's that I have. The owner said he also has some of these tubes that are Philips branded. He said that Angela Instruments was selling them. If the rest of the story is true, and Sylvania (or Philips) really sold 6AV5's as 6B4's, does this mean that the tubes are identical? NO! This means that the tubes were similar enough to be interchangeable IN THE ORIGINAL APPLICATION. There is no way that the two can ever be identical. In my listening tests there were obvious differences between the two in sound. The 6AV5 had far better bass, better dynamics, and was capable of far more power. The 6AV5 had a lower plate resistance, and was capable of passing a lot more peak current than any similar sized DHT. The story does not end there. I heard about some extremely low cost output transformers on another thread (Cheap SE output transformers), Edcor XSE15-8-5K, that were getting good reports, so I ordered a pair. After testing them with the usual DHT's and the like, I decided to go back to the 6AV5's. To cover the testing and torturing of this combination, I started another thread. The Edcor meets the 6AV5. The original test setup was long gone, so I simply repeated the procedure. Only this time the only Tubelab SE I had was my 300B amp in the Lexan case. I have experimented on it before, so I offered it up to science again. Here is the Lexan amp with 6AV5's connected up using clip leads. This time the clip leads are twisted together, and the whole setup is a lot neater than before. No more oscillation! The first test was ran at the rated 11 watts dissipation, 300 volts and 35 mA. The amp sounded OK but kind of subdued. In my usual style I turned up the power. Much to my surprise they started to exhibit the death glow at about 15 watts. This is not what I saw before. These were NOS tubes, not dirty old ones. So I found the old tubes that I had used before. OK now I can crank up the power. I was running 350 volts at 60 mA with no glow. They sounded nice, good bass, clear sparkling mids and crystal clear highs. I listened for two hours with a wide variety of music. It sounded good, but not as quite as good as the Edcor with the 300B. This was puzzling, the first pair of 6AV5's (GE's) were showing no signs of distress at 24 watts dissipation, while the second set (RCA's) was beginning to exhibit the glow of death at 15 watts. Clearly all 6AV5's are not created equal. I went through my entire collection of sweep tubes and pulled out all of the 6AV5's. Upon further investigation I found at least 5 different internal constructions for the 6AV5GA. The NOS RCA's that I tested had large slots in the radiating fins at the point where the fins attach to the plate. This would limit the thermal conductivity. What were they thinking? I also found RCA's without these slots. I have some Sylvanias, and several other flavors. When I was at the Orlando hamfest (February) I went searching for 6AV5's. I bought every one that I could get for under $4 each. Most were $3. I got about 20. I found 6 distinct types of 6AV5 tubes. Two types of RCA's (with and without the slots in the radiating fins), two GE's, a Raytheon, and the Sylvania. There were other brands but they appeared to be rebranded versions of the types listed above. I have just finished torturing (I mean testing) each type. The dissipation figures that I use are total (plate and screen) tube current times actual plate to cathode voltage. All tubes were tested at 300 volts triode strapped unless otherwise noted. All of this testing was done at very low volume (milliwatts), this is worst case for dissipation. Sherri has friends over, so I can't crank it up loud anyway. The results are listed below. 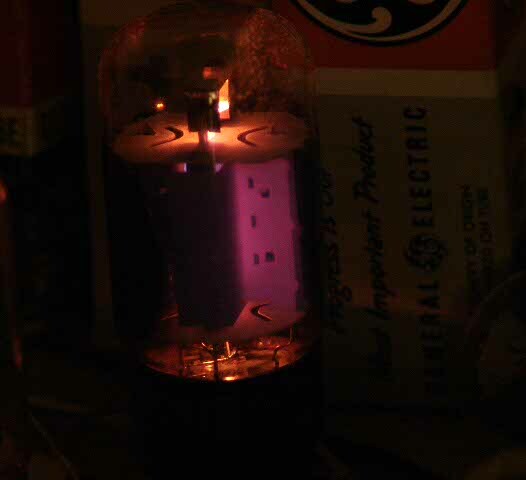 The slotted RCA's start glowing at about 15 watts, this is only slightly above the 13.5 watt rating. These all have the newer style lettering on the boxes and two letter date codes. The non slotted RCA exhibited no visible redness at 30 watts. At this plate dissipation, I could see the screen wires begin to glow if operated at 325 volts. No glow was seen at 275 volts and 30 watts. These tubes all have taller glass and 1963 date codes. 4 tubes tested. The Raytheon (I only have one here) started to glow at 23 watts. There are two types of GE's. The newer ones have plates with rounded corners that look identical to those in the 6FW5 which carries a 21.6 watt (total) rating. I tested 2 of these. One showed a slight redness, only visible with the room lights off at 27 watts. The other showed no color at 30 watts. The older GE's have the smallest plates and smallest envelope of any of the tubes tested, but they seem happy at 27 watts, and just show slight redness at 30 watts. 4 tubes tested, all the same. The Sylvanias are clearly the best of the bunch in the overload department. When you push them hard enough to get them glowing the entire radiating fin glows evenly, no hot spots. I got a few minutes to listen to the Dumonts (rebranded Sylvanias) at 315 volts, 80mA, which is the sweet spot for the Edcor transformers. They do sound nice, but I am not quite ready to trade in my (Chinese) 300B's. There is no visible glow at this level, and it takes 30 watts to see any. 2 Sylvanias, and 2 Dumonts tested. Both Dumonts have the Sylvania EIA code 312 on them. This photo was taken of a Sylvania 6AV5 at 315 volts and 130mA, this is 41 watts. Notice the even glow across the entire radiating fin. There are no hot spots. This shows good thermal design. Considering that a 6B4 is only good for 15 watts, I would use any of these tubes in a 6B4 design except the slotted RCA. Guess which one I have the most of? If you intend to build a 6AV5 amplifier and keep it around for a while, don't push the tubes too hard unless you plan to change them often. Transistors just blow up when you push them too hard. Tubes can be operated above the maximum dissipation rating at the expense of shorter life. It is not uncommon for a guitar player who plays 4 or 5 two hour shows a week to need new tubes in six months or less. NOS tubes seem to live longer than many current production tubes due to better vacuum, and most sweep tubes were over designed due to the severe service they were in. 6AV5's, 12AV5's and 25AV5's are cheap (for now) so if you plan to push them hard get some spares. My rule of thumb is to turn off the room lights and look for red spots on the plate, and glowing grid wires. Back off the bias until this goes away. Some of these tubes seem more sensitive to voltage than others. I am using a variable power supply so I can watch the current as I turn up the voltage. All triode connected sweep tubes will have a point where the current starts to rise quickly. Operation at or above this point could cause an uncontrolled runaway condition. I believe this is because we are way above the screen voltage rating. This happens at about 295 volts on some 6AV5's while others are happy with 350 volts. If you are going anywhere near this you should put a 100 (or 125) milliamp fuse in the cathode leg. It may save your transformers if a tube fails. 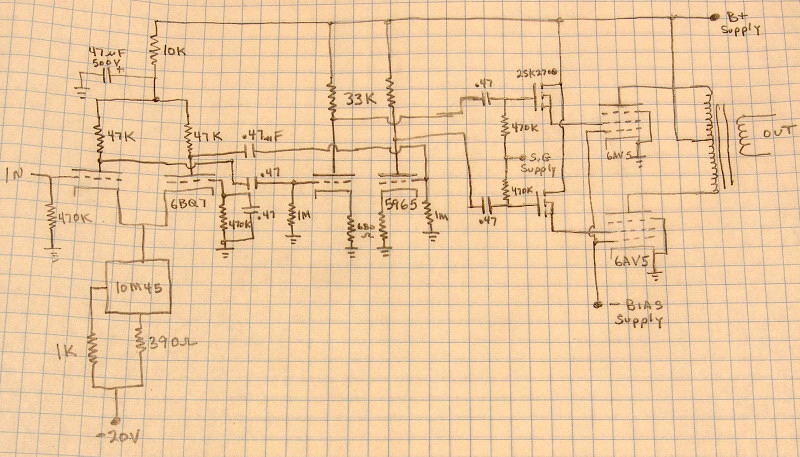 I decided to perform some basic amplifier measurements on the Edcor - 6AV5 combination. I discovered (while playing around with the 6DN7 and 6EM7) that the Edcor transformer really likes cathode feedback, so I tested that too. I set an arbitrary 5% test limit for distortion. In triode strapped mode I got 4.75 watts at 5% with 300 volts and 60 mA. 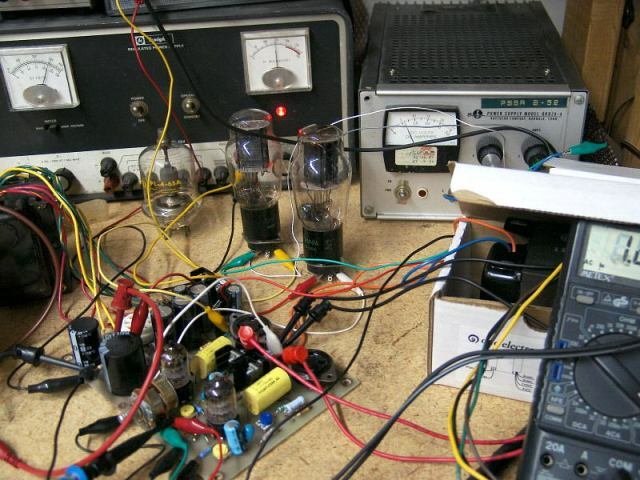 Adding cathode feedback allows 8 watts at 5% using the same voltage and current. Distortion at all power levels is reduced considerably. In UL mode I got 6.3 watts at 5% with 300 volts and 60 mA. Cathode feedback allows almost 9 watts without adjusting the power supply! This is like adding a second tube. Every once in a great while you stumble across a combination that works way too good considering what it is made of. I knew that I was on to something last night when I tried the 6AV5's through the Edcors in UL mode with cathode feedback. The measured performance was good. Well when I got home from work today Sherri was not home, so I connected up the speakers and cranked it up. This thing positively ROCKS, I played a lot of different music, the CD's that I have previously identified for their abilities in finding amplifier flaws. Complex music pushed well into clipping still sounds good, there is NO intermodulation from heavy bass guitar over a nylon stringed acoustical guitar. Voices and saxes do not get affected at all by drums or bass even with the volume knob all the way up. I can tell by the bouncing current meter that I am not in class A any more, but distortion can only be heard on a few heavy bass notes, and it doesn't sound gross. There is no bleepin way that I am listening to 3 dollar tubes through 18 dollar transformers. This thing has bass. Crystal clear highs too. I got to run a frequency response test. Surprise! 3db points are 24Hz to 45KHz AT FULL POWER! 8 WATTS. Frequency response plot at 8 watts. The vertical scale is 1db per division. Yes I am still using a regulated power supply, and a 5842 driver with PowerDrive. The next step will be to try the real power supply, and try to find a 3 dollar driver tube. When I started using 5842's they were $3, I bought 75 of them. They are not cheap any more and my supply is running low. If I am successful this could be the ultimate "El Cheapo SE". Note: Since this was written, this eventually evolved into the Tubelab SSE. Due to many e-mails and forum posts, the 6AV5 was replaced with a 6L6 or an EL-34 in that design. That decision came from two problems. The 6AV5 can not be easily found in Europe and Asia, and there is a wide variation in the dissipation capabilities of the various brands. The 6AV5 story is not over yet. During the testing of the 6AV5 in SE mode one of the forum members mentioned the outrageous power that he was getting by using sweep tubes in screen driven push pull. I just had to try it. I got this wild idea for a new Tubelab prototyping system, so I built it first. 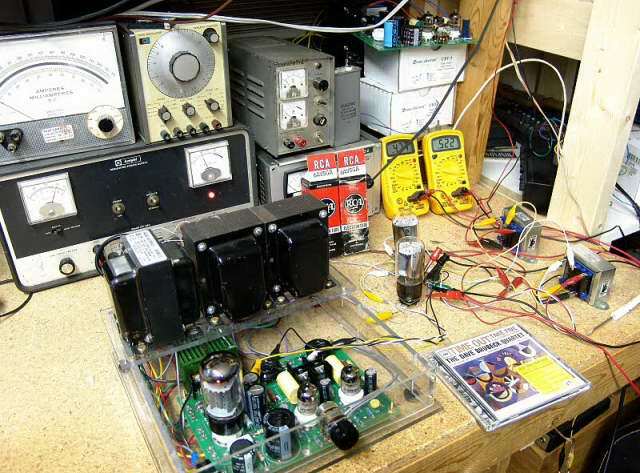 This one really does make it possible to prototype a tube amplifier without turning on the soldering iron, and all of the parts come from Home Depot and Radio Shack. See the Tubelab page for details. 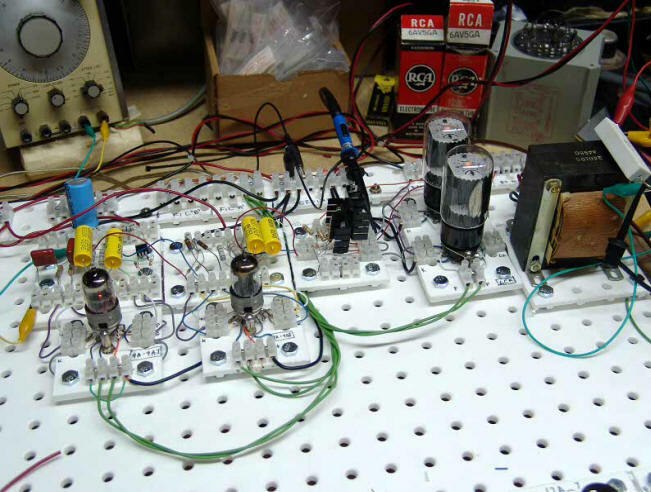 Now that I had a new prototyping lab, I just had to try it out, so I built this amp. The first stage is a LTP phase splitter using a 6BQ7, CCS in the cathode, 10 mA total. Next is the driver. This one took 4 tries to achieve success. 4 tries, 4 different tubes, one hour total time, never touched a soldering iron. The final circuit uses a 5965, 550 volts of B+. It can pump out almost 400 volts P-P into a 100K ohm load (plus the gate capacitance of a fet) at 80 KHz. A mosfet follower drives the screen grids of the 6AV5's. At full power the screen grid swings from -60 volts to over 300 volts. The driver is still the limiting factor. I can't get any more swing because there isn't any more knob left on my power supply. It is maxed at 550 volts. The output stage runs at 550 volts on the plate, and adjustable negative bias on G1. G2 is also adjustable with a second power supply. A third power supply provides -25 volts for the CCS in the first stage. I will draw up a schematic as soon as I have time. The amp is still on the Tubelab. Does it work? Well, I put in a pair of the wimpy slotted RCA 6AV5's, and tried to make them glow! Operating right on the edge of class B, I can get over 80 WATTS at soft clip! There is NO GLOW visible in the tubes with the room lights off! At 50 watts the distortion is under 3% from 100 Hz to 25 KHz. There is NO FEEDBACK local or global in this amp. Operation below 100Hz is limited by saturation in the OPT. I ran this thing at clipping for an hour, the hottest thing on the bench was the load resistor. I have not listened to this amp, or made detailed measurements yet. I need to find a better OPT. I am using one from a guitar amp of unknown impedance. I get best results with the 8 ohm load on the 4 ohm tap, indicating the need for a pretty high load impedance. Here is the close up of the amp running at 80 watts. It had been running for over an hour when this picture was taken. Here you can almost see the scope traces. The top trace is the screen grid on one of the output tubes. The bottom trace is the output. The distortion meter is on the 10% range, the needle reveals 8% distortion at 80 watts! 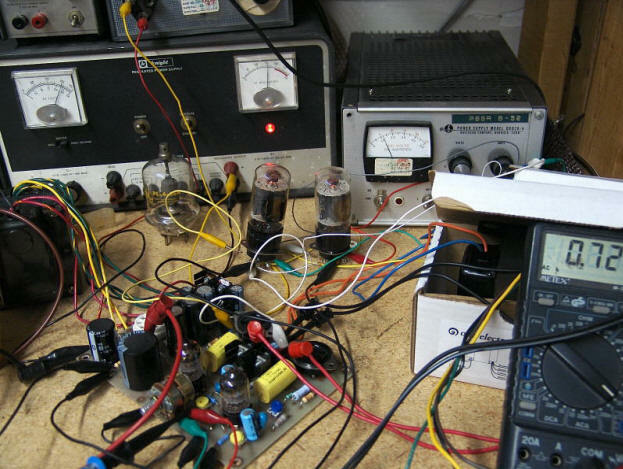 The Fluke power supply on the left is maxed at 550 volts, its current meter is reading 190 mA. That means 105 watts going into the amp, 80 coming out (into the load) leaves 25 watts dissipation split between two tubes. 12.5 watts burned up in each tube, no wonder they don't glow. This amplifier uses screen drive (no signal on the control grid). Screen drive works well with sweep tubes because they have a high gain screen grid. This is why the screen grid voltage spec is so low. Screen drive does not work well with normal audio tubes that can handle a lot of screen voltage. I plan to take this design further at a later date. I just don't have time now. There have been many requests for the schematic, so I have added it here.